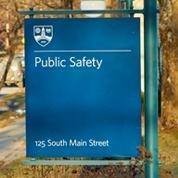 The Department of Public Safety has implemented a new self-service parking management system which is accessible online: https://www.permitsales.net/MiddleburyColl. A link to the new user-friendly system is also available via the DPS parking web page. The system manages everything from permit registration and student registration fees to payment of fines. Using hand-held devices, officers will issue tickets electronically. Registered permit holders will automatically receive an email notification about any violation related to their vehicle. For more information about parking registration, please visit the parking web page or go/parking.